Heart disease forever changed my life with the birth of my son Emerson. He was born at 9:28AM on December 4th, 1996. As a new parent, I did not know that it was not normal to not be able to hold my son for hours after his birth. Immediately the doctor detected an unusually loud heart murmur that was so loud it could be heard when the stethoscope was placed against his foot. This day marked the beginning of the greatest and worst experience of my life. After being allowed to hold him for the first time later that evening at 5:30PM, Emerson was transported to the University of Maryland Children’s Hospital because the NICU there specialized in dealing with the sickest of the sick children. At the time we did not know how sick Emerson really was. He was diagnosed with DiGeorge Syndrome, which included a severe congenital heart defect. It was explained that he would not play sports which is hard to hear for a first-time dad with hopes and expectations of watching his son play sports and cheering for him. The doctor informed us Emerson may even need permanent full time care IF he survived to adulthood. The first night he arrived at the NICU, he had to be resuscitated twice. His outlook was grim. Within two days, my dreams were crushed and I felt like I was in a nightmare. Each conversation about his prognosis with his cardiologist was worse than the last. The problem, we were told, was that since he was now breathing on his own after birth, the deformity in his heart would prevent his brain from receiving enough oxygen so Emerson would slowly become mentally retarded. In the conversation that followed the next day, his cardiologist explained that he would need a heart transplant from another child who had died. But much like a shoe on a foot where the foot grows but the shoe does not, so too would he need multiple heart transplants because his body would grow, but not his heart. The transplant would have to be performed in another city and the likelihood of him dying on the surgery table was 80%. One of the lesser problems Emerson had as a result of his heart defect was necrotizing enterocolitis. This means tissue in his bowels that was starved for oxygen was dying. He could not feed so he received his nutrition intravenously. During this time it was not possible to hold him because he was intubated and in an extremely fragile condition. We knew our time with him was running out. Although his condition was not improving, he was stable enough to have a sponge bath. He let the world know he hated baths! It was the first time there was some degree of normalcy since his birth. Six days later he slipped into a coma. On December 22, Santa visited Emerson with Christmas music playing and at 4.07AM on December 23, 1996 Emerson Spence Armiger died in our arms. This experience changed my life forever. I was 25 years old carrying my son’s casket on December 26. Christmas has never been the same. Our next pregnancy resulted in a miscarriage, but today my daughter Sophie and my son Leland are my joys. They are healthy and well aware of their big brother Emerson. In 2005 my dear friend Dave Watkins was diagnosed with a cardiac condition that required surgery to correct the defect. His successful aortic valve replacement saved his life. 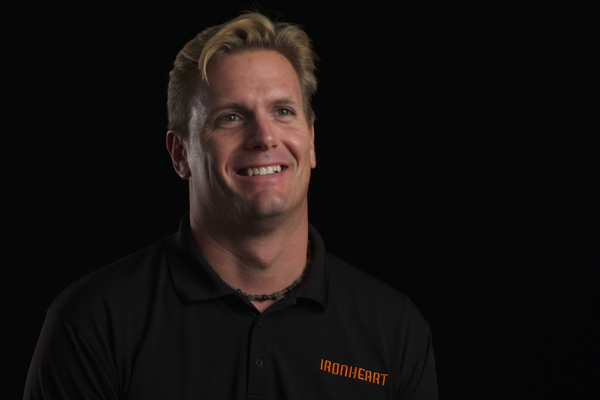 Not long after this harrowing experience, Dave approached me with the idea of creating Ironheart. Our purpose would be to support, educate and inspire athletes and individuals whose lives were affected by heart disease. It was easy to say yes since my own son died from a heart defect, my grandfather died of a heart attack when my dad was 16, and one of my closest friends in the world was nearly robbed of his life by heart disease. It was an honor to be the second member of Ironheart. 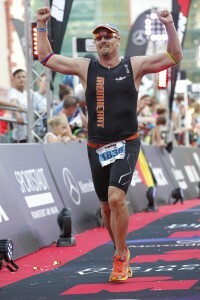 Since 1998, I had been racing in triathlon events of all distances so when Dave approached me about helping to train him for his first Ironman race in 2006, eleven months after open heart surgery, I wanted to help him fulfill his dream. His dream was less about completing a race than it was about coming back from the dead since he flat lined during his surgery. Since then, Ironheart has grown into a vibrant community where athletes of all levels and ages can challenge themselves and improve their mental and physical health through sport as well as support and educate other members in our community. I hate heart disease for what it did to my family, my friend and countless others. I race in Emerson’s memory to celebrate his life, my life and the lives of my children. It is my passion to challenge my mind and body through endurance sports, raise funds for Ironheart to help those afflicted by heart disease and raise awareness about the impact Ironheart makes in the community. From the pain and horror of watching Emerson die, to the joy of representing Ironheart at Ironman events all over the world, came a profound reverence for life and what it means to really be alive.